You have read Part 1 and Part 2 of our Ultimate Guide‘s Gucci serial number check. In this part, we will be discussing an important, if not, the most important leather tag style. This is essential in your quest how to tell if a Gucci bag is real (or fake). So, how to authenticate Gucci handbags? Of all the posts in this guide, this has the most number of photos attached. After I show you pictures of a fake Gucci leather tag and serial number, you can train your eyes on spotting an authentic Gucci bag. You want your first Gucci bag. You browsed Ebay and got overwhelmed with all the bags listed. A bag looked identical to the one above and below it. You had eye fatigue and bought the one with the serial number. It has a serial number so, of course, it is authentic. WRONG. This is a sensitive topic, as most of the fakes flooding the market now would have had this type of leather tag. It could have been the type of tag inside your first fake Gucci bag you bought from Ebay. So read on! 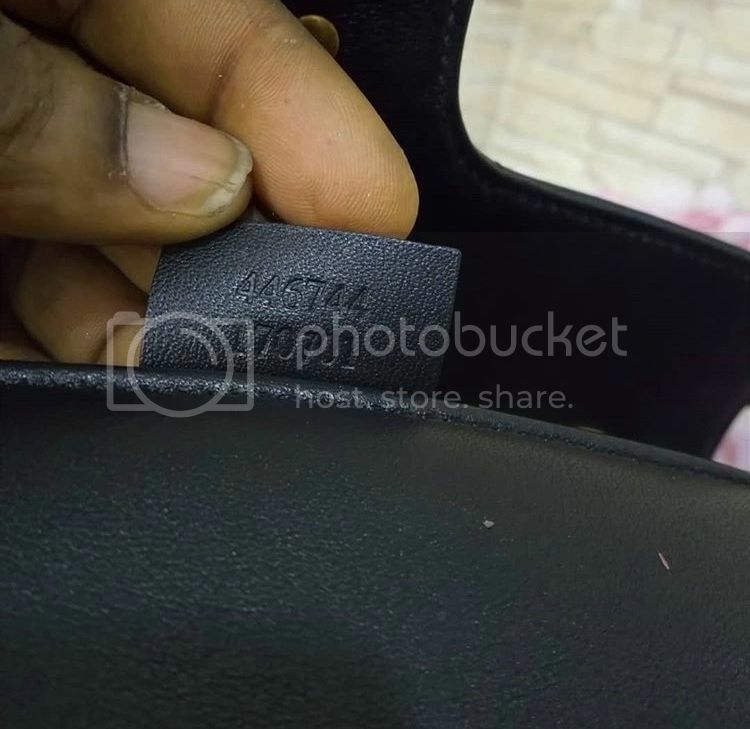 This type of leather tag is currently in production in most, if not all, Gucci bags. It, therefore, makes sense to be aware of what to look for. As I mention several times, the devil is in the details. This will help you so that next time, when you buy a Gucci bag from Instagram (flooded by fakes, by the way) or Ebay, you are well-equipped. So, how to read Gucci serial numbers? Is there a meaning to a Gucci serial number? Can we have a Gucci date code like there is a Louis Vuitton date code? 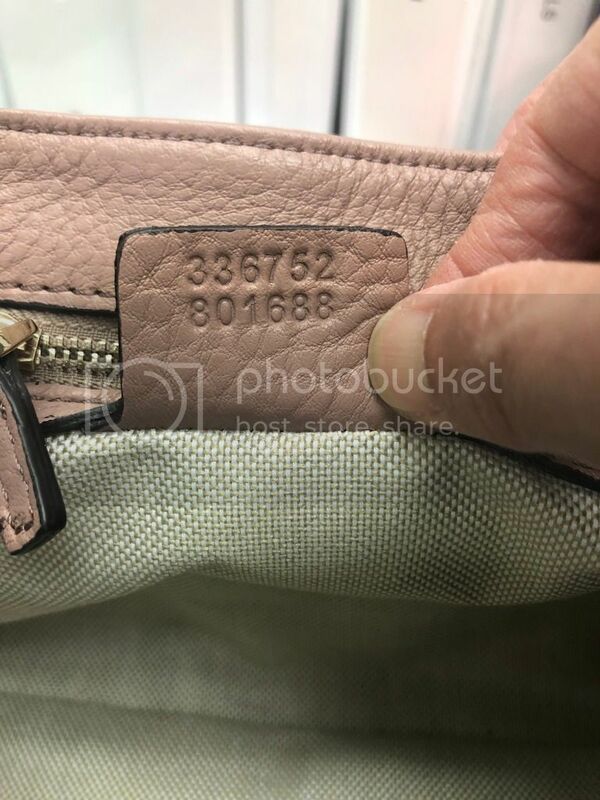 Well, the Gucci tag’s “serial number” (as this is what most people call it) has, based on the information I researched, the style code/number in the first row that should also be reflected on the bag’s price tag, and the supplier code on the second row. This means that 2 or more bags may have the same serial number. However, fakes also have the same serial number (i.e. style code and supplier code). For small leather goods like wallets, cardholders or coin purses, the Gucci serial number is divided by a period: to the left of the period is the style code, while the number on the right is the supplier code. The Gucci serial number, however, cannot give information the year a Gucci bag is made unlike the Louis Vuitton date code. Your best bet is to familiarize yourself with the styles/era the bag was made. This could be instinctive as you get more acquainted on the evolution of Gucci bags. So, you’ll have no luck looking for information on a “Gucci date code”, unfortunately. Without mentioning explicitly what makes the leather tag and the serial number fake, let us begin by looking at some fake ones. Heaven forbid that a “Gucci China”-made crossed your path! With minimal discussion of the specifics, let us begin our fake Gucci parade! (For side-by-side photos, check out these case studies on a Real vs. Fake Gucci Abbey messenger bag, Gucci Soho bag, and Gucci Dionysus bag). Let’s begin with the very bad fake ones. Look at the rectangular tag below. It is not even close to what a GUCCI font is supposed to look like. All the details we have discussed in this post are not present. While I may take offense with the bad edging job on this bag, I’ve seen a couple of authentic Gucci bags that leaves a lot to be desired on this aspect. For this fake Gucci serial number, it appears to be authentic for an untrained eye. Sometimes I watch fake items on Ebay to see how high these would go. Unfortunately, it’s either the seller feign authenticity or, most of the time, the poor buyer just did not know at all. I’ve seen bags with this hideous serial number font sold as high as $200! What you should remember is that for rectangular Gucci leather tags, they are composed of two rows of NUMBERS (only numbers, you’ll eventually see below why I emphasized this). While there is no consensus on what these numbers stand for, one of these rows could represent the style of the bag. A quick Google search of the serial number (even just one row) will show in Google Images a similar bag. Even if you search the whole thing, again, Gucci serial numbers are not unique. Here is an example of a fake serial number font for a popular Gucci bag. This is for a Gucci Monogram Canvas Tote Bag with Red and Green Stripe Handle. I might be jumping ahead of my post here, but I’d like to quickly post this authentic leather tag and serial number of the same style for instant comparison. Anyway, compare the details of the serial number from the fake one and the authentic below it. The font of the serial looks miles apart. Don’t worry, we’ll have more examples. Let us continue with the fake parade, as things will progressively look more difficult. Look how sloppy the GUCCI is. It appears that the two Cs got into a fight. Also, why is there a letter in a Gucci serial NUMBER? 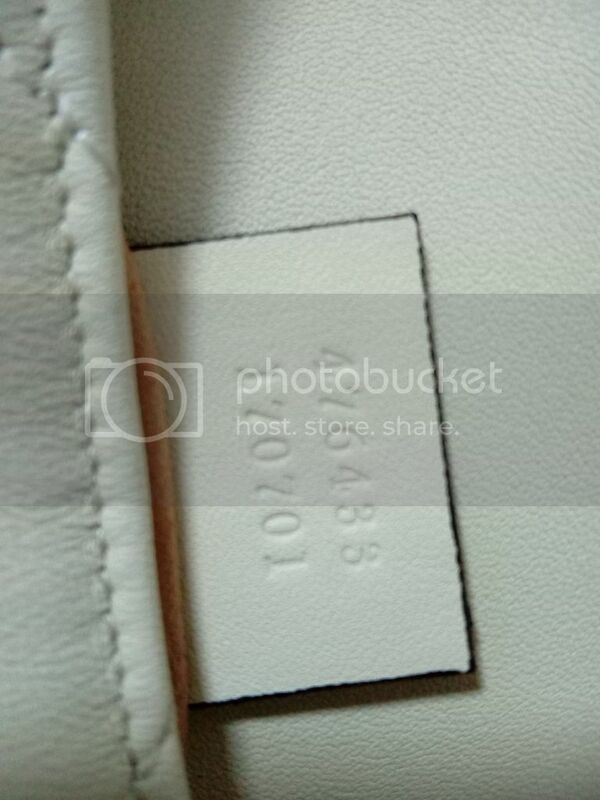 In the next two photos, both are fake leather tags and serial numbers of the same style of bag. The last serial number photo in this Gucci fake parade is something you should be careful of. In the example below, it seems that the front of the leather tag got all the details correct. But as you turn the tag, you will see the waving red flag. Scary, right? That’s why you must study all details as closely as possible. Look at the font at the front and, especially, the numbers at the back. Here is another fake bag, this time a Gucci GG Canvas Positano bag with a scarf. It is worth zooming into the photo because the leather actually looks decent. But upon close inspection you can see the details of the GUCCI are off, and the serial number is nothing like what is used on authentic Gucci bags. This will be the most tedious, but definitely the most helpful part: what to see on authentic Gucci leather tags. I have combed my hard drive and other storage to compile as many photos of authentic Gucci bags on Ebay (and other online platforms) that I sold. The front should have the registered trademark symbol (®), which I guess you already know from the fake parade above. Then the GUCCI font under it, followed by an all lowercase ‘made in italy’. BUT there are rare cases where the symbol is missing in authentic Gucci bags (I posted a photo towards the end). Contrary to what you may have already read online, it is impossible for ALL Gucci bags to have that defined embossing on the leather. Why? There are a couple of factors. This could be because: a) the material itself could resist properly defined embossing (e.g. pigskin leather with hair follicles), b) the leather eventually got worn and soft that made the print shallow (this is especially evident on GUCCI embossed zipper pulls), c) there are bags bought from Gucci handbags outlet, which are made from excess (I prefer this than scrap) materials, and had less stringent quality control, or d) a bag even from a flagship store could have been deemed acceptable under inspection because all other details are up to standard (again, Gucci is no Hermès, quality-wise). This list is not exhaustive. A Gucci serial number should have two rows. While the bottom row is made up of a block of numbers, the top row can vary. On some bags, it could also be a block of number. But in others, it is grouped into clusters of two, divided by a dot or in rarer cases, a dash. Again, I would not want to give out as many details to prevent counterfeiters improving their fake bags. Just let the details in the photo sink in. Pay special attention to the font in order to do an effective Gucci bag serial number check. Remember the authentic Gucci coated monogram canvas messenger bag I bought for $10? Here is its leather tag and serial number. These are some of pigskin Gucci leather tags, making it tricky to make out the details but you can still see it. The follicles also make some of the details look a bit weird. Remember what I mentioned about leather getting worn and soft? 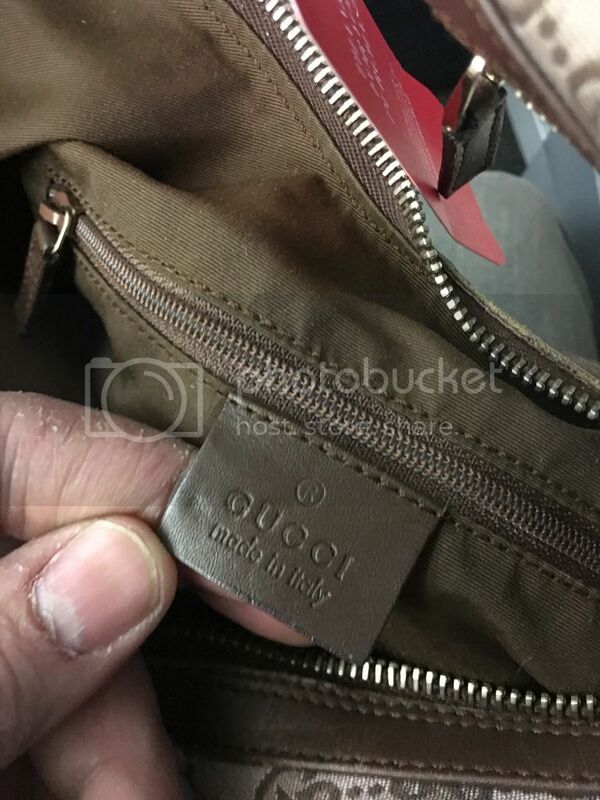 See the details of the first Gucci leather tag and the serial number below from a monogram canvas messenger bag (this has perforated leather trims on both sides, and two leather straps with velcro in front, if I remember correctly). The rest suffer from the same fate. The one below is an exception. It is missing the registered trademark symbol on top. This is a Gucci bamboo handle with a satin body. But it is, definitely, authentic. We can also observe this side-by-side comparison of a Gucci Gifford tote (one brown and one black). I hope that by now, you already get the gist of how to tell if a Gucci bag is real, with the help of scrutinizing the leather tag and the serial number inside. Next section will discuss exterior details of a Gucci bag. Hint: Bookmark this page as reference next time you drop by an estate sale or Goodwill to look for Gucci bags. Thanks you I was able to spot a fake Gucci handbag on Ebay! I can’t believe I almost lost $350! 001-115-6794 I have a Gucci bucket bag. What can you tell from this number? I am looking at a Gucci bag on Ebay. The leather tag inside has no hardware but is stamped “Acessories Collection” with the R for trademark, the crest, and “Made in Italy.” However, the underside of the tag is fabric (Almost a burlap) and has strange serial numbers and writing about authenticity in both English and French running perpendicular to the serial numbers on either side of them. There are also asterisks in front of the second row of numbers. Here’s a link to the ebay page. Thanks! Hi! Can Gucci bags have the same serial number? Thank you! Hi Lolly! Yes, they may do, but it doesn’t guarantee authenticity. To be sure, you may try BAGAHOLIC 101’s authentication service for only a minimal fee of US$ 5. More information here: https://bagaholic101.com/gucci-authentication-service-by-bagaholic-101/ . Cheers! Thank you for your quick reply. I cancelled the order when I saw that another bag from another selling app website had the same top and bottom serial number. I was not going to spend $600 for a bag that doesn’t guarantee authenticity, even though the website and seller say that they do. Again, thank you! Thank you. This was very helpful but I wonder if it is possible to send you a photograph of a supposedly authentic vintage Gucci. Hi! Kindly post a photo of the bag through a Photobucket link or any image hosting site. Cheers! I am still unsure if the bag I bought is real or not. Any chance you could give me your opinion if I sent you pics? It smells like leather and feels like good quality, inside and out. Tag with serial number says 130994 9791. Hi! You can post a link to your photos so I can have a look. Upload it on Photobucket or any image hosting site. Cheers! I bought a supposed vintage Gucci bag just last night from a vintage select shop in Tokyo, and I’m getting a little worried that it might be fake! It’s too clean for it to be old and the serial number is longer than the pictures you provided: 001•58•6850 8039. I’ll happily provide you pictures if you’d email me! Please help! Hi! I’ve seen vintage ones in excellent condition! I managed to recently buy one without the flaking lining problem etc, and it is authentic. Post a link to the photos so I can help you. Cheers! Hi, Can you please help me verify if this is authentic Gucci Dionysus bag? I would appreciate it a lot !!! Serial number looks fine to me but I’m no expert unlike you. The photo of the serial number and the Gucci tag needed to be clearer on this Dionysus bag, to be sure. Hi, I’ve brought this bag, could you check the listing and confirm whether or not you believe it to be authentic? Thank you! Looks like an authentic Gucci Swing tote bag to me! Hi no red flags so far but kindly ask for a clear photo of the front of the Gucci tag for both bags. Happy New Year! 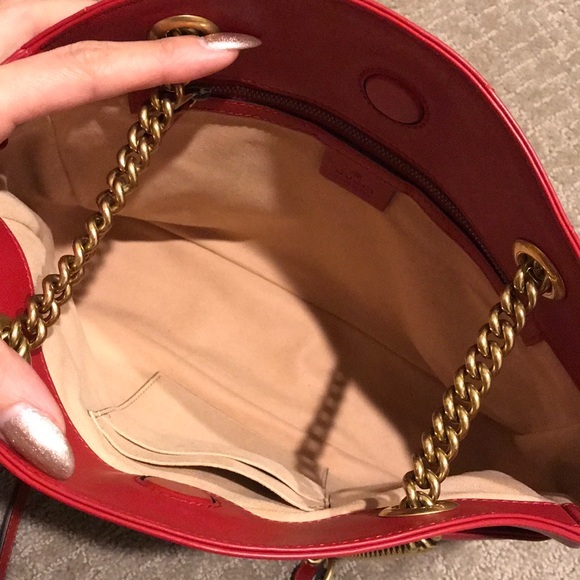 IMO, the bag for sale from Poshmark is an authentic Gucci bag. Hi, unfortunately this is a fake Gucci Dionysus bag. Beautiful, authentic, vintage black leather Gucci bag with original dust bag. With shoulder strap and front pocket embossed with Gucci. Bought from Gucci in London. Vintage item – label shows Gucci Italy. I’ve received it today and the tag inside has the wording”GUCCI” italy. The inside of the front pocket has a small area of damage showing white paper type of material where the layer of leather has come off. It doesn’t feel or smell like leather but I can’t really tell as it could be leather faced. It came with a cream dust bag with grey GUCCI wording and grey drawstring. As it states “vintage” not sure if it’s ok or not. Hi, please post photos of the bag so I can help you out. Cheers. Hi i just purchased a bag from poshmark but the serial number tag is a bit sketchy, the lining is so off. plz help me check tyty!! Hi Jess! This Gucci Marmont bag with serial number “498110 1972A” is fake. Serial numbers do not have, well, letters! Cheers! Hi Chloe! You may try BAGAHOLIC 101’s Gucci bag authentication service for only a minimal fee of US$ 5. More information here: https://bagaholic101.com/gucci-authentication-service-by-bagaholic-101/ . Cheers! Hey! Your website was so helpful!! I wanted to share images to see if you think this bag is authentic or not? Hi! Seeing this photo (https://i.imgur.com/07dUysy.jpg), it is a fake Gucci Dionysus bag. Hi can you please check for me if this bag is authentic or not? Would really appreciate it thanks in advance.. The bag on the link is, unfortunately, a fake Gucci bag. Help please, my Mother (Family from Wales) recently passed away. I came across a Gucci bag (Stunning Vintage Bag; REAL or not.) Also, found the serial number listed along with the correct GUCCI with the circled R above Gucci & underneath “made in italy” font on the front and the inside tag. Yet the Serial No. is only listed on each of the closures/clasps front Hardware only has one sliver “G” on the clasp? The bag is leather well made, perfect stitching, silk interior with 1 zipper (Saw a # 7 alone directly on the inside of zipper (as with COACH where you’d find YKK listed there.) pocket as well as a pocket behind the zippered one. Opposite side has 2 small pockets. Shoulder straps have a a leather snap closure to keep the straps together to hold up the bags shape/design as well as the 4 Hardware in Silver pegs at the very bottom of the handbag therefore it stands up. Red/Brown Leather Handbag (40-60’s Era?) Exterior Color matches the Leather & Satin interior as well; Silver Hardware. However, I have seen many different FAKE designer bags with the serial number listed. Hi, first of all. I’m sorry to hear about your mother passing away. My sincere condolences. As for the Gucci bag, perhaps you could post photos here. Upload it online and paste the link here so I can help you out. Hi, your website is absolutely amazing and informative! I was just wondering if you could check this bag for its authenticity. Thanks! Hi! So far, no red flags. But needs photo of the leather Gucci tag and the serial number to be sure. Cheers! I have a dilemma, You state early in the article that the serial numbers range from 10-12 digits and never more than 6 digits per row. I thought ah-oh, mine it is fake since it has seven digits in the top row and 13 total! Then farther down your article you post a bunch of photos of “authentic” serial numbers with 7 digits in the top row and 13 total. Also, is there a website where you can punch in your serial number for verification? Hi! Hi! Please post photos of the bag so we can have a good look. Gucci serial numbers are not set on stone and they do not have a dedicated website to check this. Cheers! I posted this to ask if real months ago and it has been deleted??? Can you help tell me if this is real ?! Hi! Sorry if I might have missed this. This is an authentic Gucci monogram bag. Cheers! Was considering this. Does it look legit to you? Hi! It says the serial number is on the box, but there should be one embossed on the leather as well. Might be tricky to get a photo because of the narrow space. However, we need to see it to be sure. Cheers! Hi! Kindly authenticate please? Pics included. can you may see if this bag is true or not? Hi! Needs more photo of the bag, especially the leather tag and the serial number. Cheers! Hi. I bought this bag from Carousell that said it is an authentic vintage Gucci bag. Once, I received it I knew it was fake. I tried to compare the stitches and tag fonts/serial numbers with my Gucci store bought bag and it is not the same. When I complained to the seller she said it’s guaranteed authentic bought by her sister from Japan. Please check if this bag is real or not. Thanks. Hi! The Carousell link you have posted for the Gucci bag is invalid. Please check the link. Cheers! Could you be so kind and see if this bag is true or not? Hi! I need a clearer and close-up photo of the Gucci serial number and leather tag to be sure. Cheers! I’ve just found a bag in amongst some charity items i bought. It is supposedly a Gucci waist bag but i’ve checked online and here on your helpful website and it doesn’t have a serial number tag anywhere. Everything else seems to be ok but i’m no expert. Do all Gucci bags have this tag with the number on it? Thanks for your help. Hi! It’s supposed to have a serial number, as even small Gucci wallets have one. Maybe the tag is hidden on the seams of the bag. Try to carefully look for it with a flashlight on hand. Cheers! Hi! Please help me authenticate this bag. Badly need your help! Hi, to be sure of this Gucci bag, please include a photo of the front of the leather tag. Cheers! Here are more photos. I really appreciate your prompt reply and help on this! Thanks for the photos. Can you please get a clearer/not blurred photo of the leather tag and serial number again? I cannot make out the details. Hi, I believe this is an authentic Gucci bag. Patent is really tricky to take detailed pictures of. Hoping you can assist me with this matter and verify if the bag I possess is real. Hi! Please post a photo of the whole bag as well. Cheers! Hi! Can you tell me if this is authentic? Thanks! Hi! The link you posted is invalid. Cheers! Hi! This is an authentic Gucci Guccissima Jackie-O bag. Beautiful! Cheers! I’d really like to buy this bag could you please tell me if you think it is authentic! Hi! 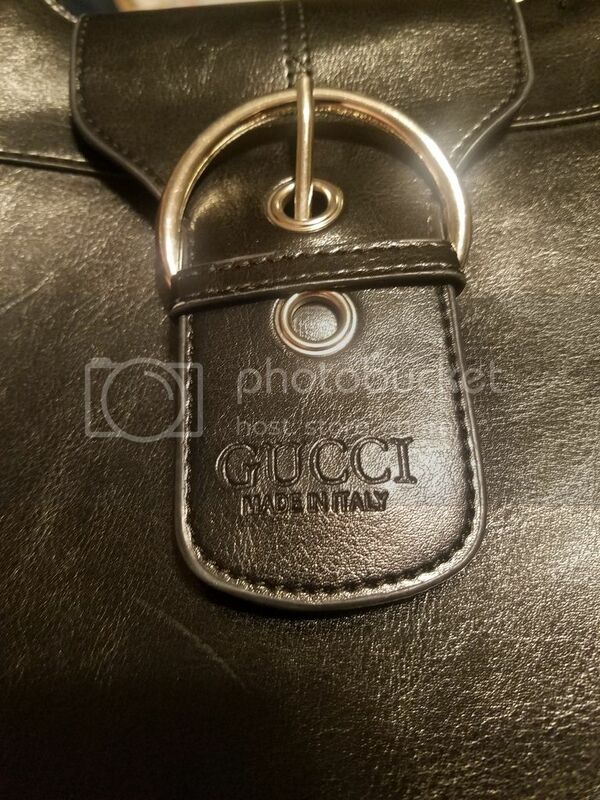 Please post additional photos, especially the front of the leather tag for this Gucci marmont bag. You may upload it on Photobucket or Tinypic. Cheers! I have gone through all your pointers in reference to the bag in the link below but as it claims to be vintage I’m unsure- any help would be appreciated, many thanks!! Hi! Yes this is an authentic vintage Gucci bag in navy monogram. Sorry as I do not have an example of this canvas in my Ultimate Gucci Guide, although the bag in question has the hallmarks of an authentic Gucci bag. Cheers! Its possible that same code in a bag? Hi! Yes, it is completely possible to have same codes. Cheers! Been looking at this one but can’t figure out the model. Bought in 2010. Can you tell if it’s real? Hi! This Gucci monogram bag with serial number “154982 001998” is authentic. Cheers! I have been told that this bag is fake due to the wonky serial number and lack of a badge on the front- a second opinion would be very much appreciated! Do you have any thoughts on this vintage bag? It looks to me as if the metal gucci tag that would be on the inside has come off- as you can see the indentations where it would have been maybe? Seller said their Mum got it from Harrods around 1975. Any help would be great- thank you! Hi! This Gucci bag with serial number 001.116.0914 is authentic! I reckon the missing part of the tag is a golden metal plaque with embossed GUCCI MADE IN ITALY. Cheers! May you check if this is an authentic gucci bag? Thank you! Hi Nunzia! Not enough photos to authenticate. Please post a link of photos of the leather tag and the serial number so I can have a look. Upload it on Photobucket or any image hosting site. Cheers! 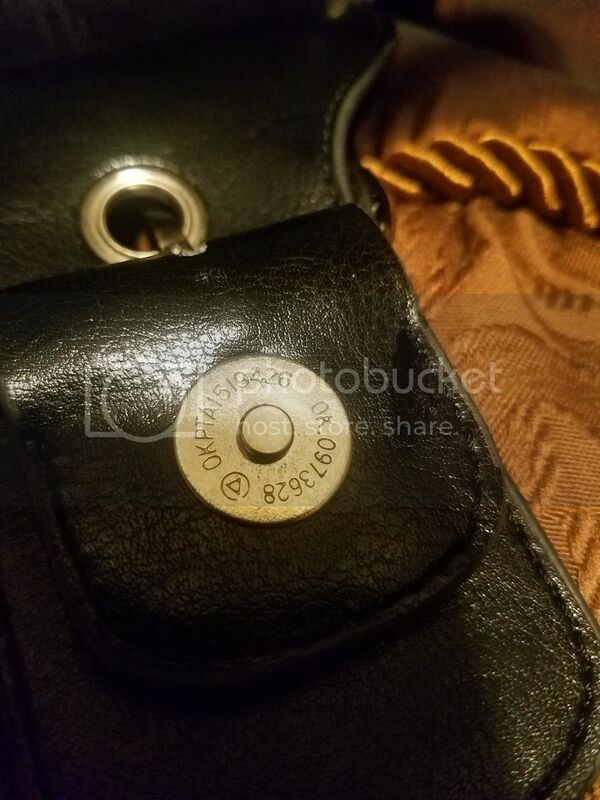 1. a black tag (in a similar material as those care instruction tags you see in clothes) with the word Gucci and a series of numbers below it was placed inside the “main” bag compartment. unlike most interiors i have seen online that had no black tags in their bags (from poshmark: https://di2ponv0v5otw.cloudfront.net/posts/2018/01/23/5a66eec72ae12f6bd3d35812/m_5a66eef99a9455370d38c671.jpg). I think i have also seen a gucci bag that had it inside the zipper compartment. 4. the leather zipper pull was sewn oddly too. your examples were all sewn atleast all 3 sides of the rectangular pull except the side of the D-metal. My mutual friend’s bag only had the 2 longer sides sewn and short side, the parallel side to the D-metal had no stitches as well. I hope you can help me identify if its real or fake since i am too shy to ask that friend if it is. 4) You may post a link to your photos so I can have a look. Upload it on Photobucket or any image hosting site. Cheers! Wondering if this is real? Bought this after reading your article. Hopefully I was right. Hi! This Gucci denim monogram bag with signature horsebit hardware (serial number 101971 002058) is authentic. Congratulations! Hi, i need your help. Can you please check if this bag is authentic? Hi Ash! Kindly post a clear photo of the front of the leather tag as well. Cheers! Hi! I want to buy this bag, would you please check if this is authentic? From your article, it seems real to me..
Hi Tracey! In my opinion, this leather Gucci Marmont bag with serial number 443497 201688 is fake. Is this an authentic purse as well? Hi Dee! I believe that this Gucci Soho bag with serial number “336752 801688′ is fake. Is this an authenic Gucci purse? There are no tags on the inside, but it does have serial numbers on the snap. Hi Dawn! Unfortunately, this is a fake Gucci bag. I’m sorry. Hi, I’d really like to buy this bag could you please tell me if you think it is authentic! Hi Yadira! This vintage Gucci Accessory Collection bag with serial number “14.02.013” is authentic. I have gone over your post and many others and still I am not 100% sure I can spot a fake. Please help 🙂 https://photos.app.goo.gl/Gey8japo3sYvwsfw6 is this real? Looking at the numbers I would say it is a fake. Thanks a lot! Hi Ana! The photo you provided is too dark. Please provide clear and close-up pictures of your Gucci bag, especially the leather tag and the serial number. Cheers! Hi Chan! Sorry for the late reply. In my opinion, this Gucci Boston Bag in monogram canvas with serial number 247205 525040 has no red flags. But to be sure, please provide a photo of the front of the leather tag (the one with the serial number). Cheers! I’m resending my request as I responded to the wrong string earlier. Sorry about that. Please let me know if the purse on the attached is authentic. Thank you so much! Hi Dee! I’m 100% certain that this Gucci Soho Med Chain Bag with serial number 336752 801688 is fake. Sorry about this. Hi Zy! This brown Gucci coated monogram canvas tote bag with serial number “133168 0023” is fake. Hi Tiffany! Unfortunately, this Gucci bag with serial number 133168 0923 is fake. Hi! I would be needing clear photos of the leather tag and the serial number underneath. Cheers! Thank you very much great job man! Fantastic topic! Tell me please about this bag, is it authenic? Photo with sn is in the end. Thank you! Hi Eric! This Gucci bag with serial number 32160 3444 is authentic. Cheers! Hi, I wonder if this GUCCI bag is authetic or fake..
Hi Paul! Please upload photos of your bag on Photobucket or Tinypic to be sure. Cheers! Hi! Please provide photos of the bag. Cheers! Hi Jeramy! Please upload photos on Photobucket or Tinypic and paste the link here so I can have a look. Cheers! Hi! Please help to check the bag is from outlet or is a fake one. Because the seller insist this bag is not from oulet but the learher tag do have G inside the circle. Thank you so much! Hi Vicky! The seller can insist all he/she wants but this Gucci bag with a G mark is definitely a made for outlet bag. Hi,Icurious I found a bag at a yard sale that says Gucci MADE IN ITALY I on the outside. There isn’t a authentication number inside on tag, edges are rounded on tag. I dont think it’s real but I cant find a style similar to it. Its a top handle satchel, brown. Hi Angie! Please post photos on Photobucket or Tinypic and paste the link here so I can have a look. Cheers! Hi! I was thinking about purchasing this Gucci sukey Tote, but I’m not 100% sure if it’s authentic. Will you please help me?! Here is a link to photos. Hi Leena! Insufficient photos to make a judgment. Please post detailed photos of the Gucci Sukey bag. What specific pictures would you need? I will get the seller to send me more. Thank you! Here’s more pictures. Thank you. Let me know if you need more. Hi Leena! This brown Gucci Monogram bag with serial number “211943 001013” is, unfortunately, fake. The seller advises she has an authentication card and the dust bag but nothing else to confirm that it is genuine. Please help!! Hi Maddie! I cannot quite see the details of this Gucci Marmont bag. Is the serial number “4476744 470701”? I need to see clear photos of the tag to be sure. Please help! I’m afraid I just bought a fake! Hi Eileen! Yes, you are correct. This black Gucci Marmont Bag with serial number 85810 443497 is fake. Hi i love your posts and often fo here to make sure i am purchasing the right bag. Bought 2 vintage pieces and one of them seems off. Can tou please help me? Do you have photos of the inner markings like tags and serial numbers? I tried to post a comment but it won’t show. Hi – not sure if you got my reply to your response! 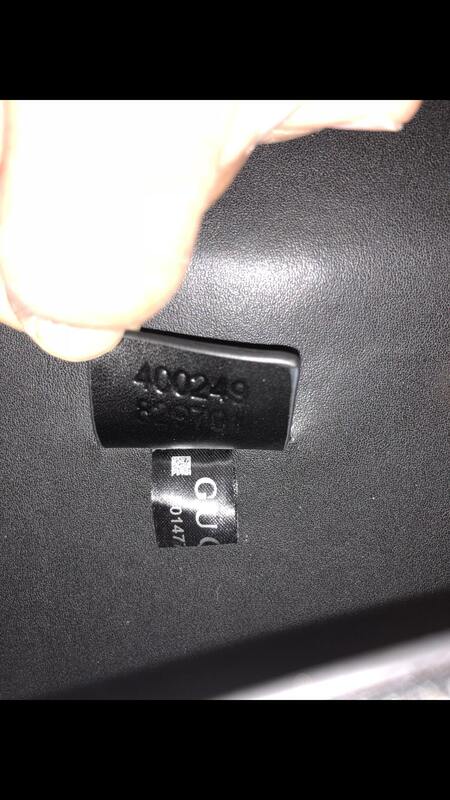 The serial number is 446744 170701 i have a few more clearer photos which i asked the sender to text me if that helps at all? Hi Maddie! I need to see the photos of the leather tag and the serial number. Let’s wait for that. Cheers! what is the best way to send these to you? Please upload on Tinypic or Imgur and paste the link here. Cheers! Hi Maddie! I believe this Gucci bag with serial number 446744 170701 is authentic. Hi! Please photos via Imgur or Photobucket. Cheers! Kindly authenticate this gucci handbag as per link below. Hi! This brown Gucci Sukey Monogram bag with serial number 223974 002122 is authentic. Hi, can you help me with this bag. I tried to upload yesterday however not sure if it went through. I appreciate your expertise on this. Thanks so much. Hi Beth! Unfortunately, a lot of red flags on this brown Gucci Monogram Hobo Bag with serial number 106250 1705. I would recommend not to proceed with the purchase. hi this is the bag I purchased that I would like checked please , thank you again ! Hi Erika! Unfortunately, this Gucci GG Marmont Matelasse Bag with serial number 448065 008658 is fake. Hi Angela! Is this for the Gucci Dionysus bag? Kindly post the correct link. I cannot open the link that you put. Thanks! Hi Angela! Needs clear and close-up photos of the leather tag and the serial number. Thanks! Hi Anh C! Needs clear and close-up photos of the leather tag and the serial number. Thanks! Hi, thanks for your guide i really appreciate it, can you help me with this bag? is it authentic or not? Thanks! Hi Linda! This Gucci monogram canvas belt bag with serial number “28566 002058” is authentic. Cheers! Hi! Please have a photo of the serial number for this Gucci Marmont bag. Cheers! Hello! Wondering if you are able to tell if this is a fake or authentic piece? Hi CW! I need clear and close up photos of the Gucci leather tag and serial number “131220 205141”? to be sure. Cheers! Thanks so much for the great tips. From your post is think my bag is real, but would highly appreciate if you’d take a look!! Hi Rachel! I need more photos of this Gucci bag with serial number “476433 170701”. Cheers! Hi, would you mind to see if this bag authentic? Bought it on ebay but hasn’t paid yet. I wonder this bag is vintage but it has like new cotton lining. Hi Rizqi! Needs more photos of the Gucci bag to authenticate — although I am a bit concerned with the bag, as vintage Gucci Accessory Collection bags should have boarskin leathers with visible pores, but this one is shiny leather (possibly faux cowhide). Hi Marie! You have provided a private Google Drive address. Kindly make it public or upload your photos on Imgur or Tinypic for me to check. Cheers! Hi Connie! I am not Linda, I am a dude. Anyway, I need more detailed photos of the bag, as clear as the photo of the serial number. Cheers! can you help me with this bag? is it authentic or not? Thanks! Hi Nana! You have provided a private account. I cannot see the photos. Cheers! Hi Shine! I would be needing a photo of the front of the tag for this Gucci messenger bag with serial number “201447 205027”. Cheers! Attached are photo’s of a 30-yr old Gucci bag purchased in Italy. Hi Charles! I cannot see any photos. Kindly upload clear and detailed photos of the bag on Imgur or Tinypic, then upload the links here to check. Cheers! Hi Rose! Needs to see clear and detailed photos of the bag to authenticate. Kindly upload on Tinypic or Imgur, then paste the link here. Cheers! This is such an incredible site & thread. So glad I found it in time. I’m considering buy this gucci horsebit bag, its pretty old not sure of the year but a discontinued one. the seller has good ratings so I hope its authentic. Please see the photo of the serial number & bag model & advise if this is authentic or if I should avoid making the purchase. Hi Bianca! Yes, this Gucci horsebit bag with serial number “131470 213317” is indeed from the Tom Ford era. It is authentic. Hello I have been looking at a bag on EBay. Can you let me know if it is a true authentic bag? Hi Nicole! The Ebay seller did not include any photos of the Gucci leather tag and the serial number of this Gucci Coco Capitán logo belt bag. Hi Brie! 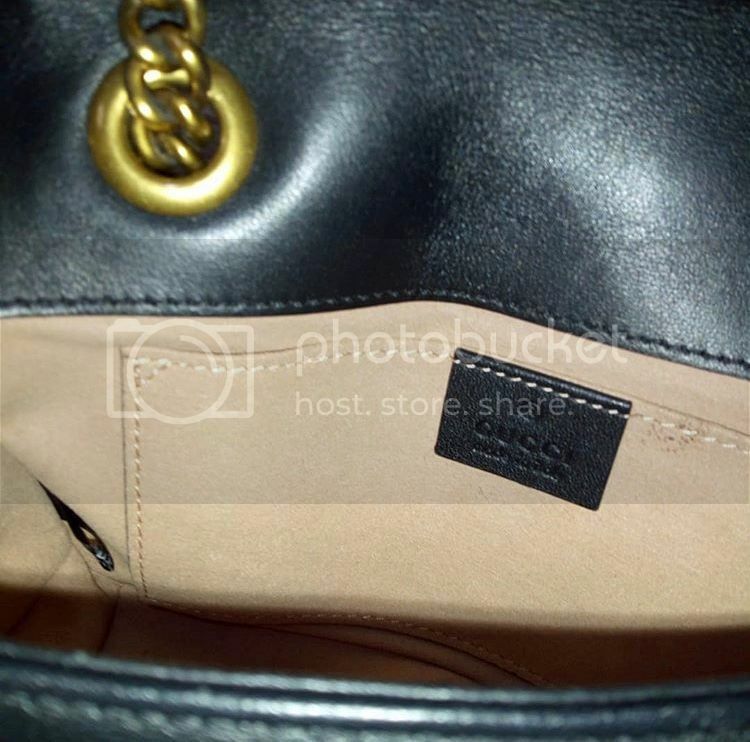 Thanks for sending these photos for this Gucci Marmont bag with serial number “443496 201010”. 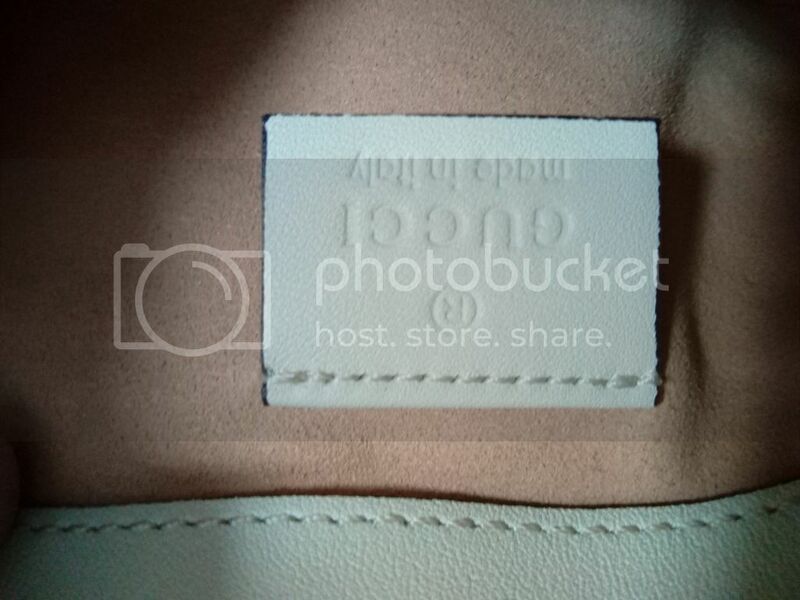 Will you be able to post a clear and close-up photo of the front of the leather tag? Cheers! Hi there I don’t know if my email went through was wanting to know if you could help with this bag- please let me know if it’s real ??? Hi Brie! Please post a photo of the front of the leather tag as well. No red flags for this Gucci Marmont bag with serial number “443496 201010”, but I’d like to be sure. Hi RB! Please upload a photo on Tinypic or Imgur, and paste the links here. Cheers! Hello, I don’t know if my previous post posted. However, I am inquiring about a Shelly Vintage Belt Bag I purchased off eBay. I’m having doubts about the bag although, it did come with a dust bag. The serial number is 28566 002122. I’m not too sure how to upload pictures but let me know how and I can definitely do so. Hi Reena! Please upload a photo on Tinypic or Imgur, and paste the links here. Cheers! Hi Trish! This Gucci suede bag with serial number “95107 002058” is authentic, from the Tom Ford era. Cheers! Hello genius bag junkie, can you please tell me if this authentic please!! Hello!! Can you please tell me if this authentic please? Hi! So far, no red flags for this Gucci Marmont with serial “448065 493492”. However, to be sure, I’d like to see a clear and close-up photo of the front of the leather tag. Cheers! Thanks so much for commenting back! Will these help you out? Hi! The link is not working. Hi. Really need your help. Have a Gucci Courrier soft GG Supreme duffle bag with serial number 459311 525040. Looks legit but I´m not sure. Can you help. please? Hi Mette! Please upload photos on Imgur or Tinypic, and post the links here. Cheers! Hi. PLEASE HELP: Looking at the Gucci Courrier soft GG Supreme duffle bag with serial number 459311 525040. I looks very real but its so hard to tell. Hi! can you help me check if this bag is authentic? Hi!! These are photos from a seller on Ebay of a bag I’m interested in. Would you be able to tell if this bag is authentic? It’s a bag that is currently being sold in Gucci stores. Hi! I tried to send this yesterday, but unsure if it worked. I was wondering if you could help me figure out if this bag is real or not. It is for sale on Ebay. It is a bag that is currently available in Gucci stores. I’m very interested to see if it is authentic. Thank you!! Hi Nicky! I need to see clear and close-up photos of the Gucci tag and the serial number “439311 170701”?. It is too small, the ones you uploaded. these are photos from ebay. i requested closer photos but this is all she sent. hope it helps! the serial is 459311 170701 thanks for any input! Hi Nicky! The serial number “459311 170701” on this Gucci is clearly fake. Yes, I have to approve comments as I receive a deluge of spam comments. Cheers! can you verify this bag? Hi Eric! I will be needing clear photos of the Gucci tag and serial number. Please upload on Imgur or Tinypic, and put the link in your comment. So far, I see no red flags but best to be sure. Cheers! Hi, I bought this bag second hand, it is pretty convincing and came with the box, dustbag and receipts but I thought I’d ask your thoughts on the serial number to be sure. What do you think? Is this super mini dionysus authentic? Hi Jamis! Please post additional photos of this Gucci mini Dionysus with serial number “476432 2067”. So far, I don’t see any red flags. Cheers! Hi MZ! Let us wait for detailed photos of the bag from the seller. I will be very wary of Ebay auctions for Gucci Marmont bags (or any Gucci bags for that matter) without these detailed photos. I’ll be waiting for it. Cheers! Hi Eve! Yes! As mentioned here (https://bagaholic101.com/ultimate-guide-tell-gucci-bag-real-fake-gucci-bag-serial-number-check-1/), “very early handbags by Gucci had model numbers, but things changed around 1960s as some handbags had while the other did not have a model number.” Cheers! Hi Carmela! I will be needing clear photos of the Gucci bag, especially the Gucci tag and serial number. Please upload on Imgur or Tinypic, and put the links in your comment. Cheers! Would appreciate if you could help authenticate Gucci bag that I just bought. Used condition. Dust bag provided. No receipt. Hi Petra! I’m sorry to hear about this. Please file a dispute on Ebay, an open a “Significantly Not as Described” case. Hope you get your money back. Hi. Thank you! Yes in a process of getting money back although she started to play ‘no fake ‘ game. Could I trouble you to look at one more item for me. I didn’t purchase it this time. Thank you. Luckily I’m getting money back but she tried to play a game. Could you please look at one more for me. Didn’t buy that one! And not sure I will. Hi Petra! Yes, I hope you get your money back. Unfortunately, this Gucci Marmont Small Matelasse bag with serial number “323663 525040” is also fake. Hope you find an authentic one soon. I do not know if my post went through so I apologize if this is a duplicate. Please help authenticate this Gucci Marmont Small Top Handle Bag that I purchased from ebay. Hi Sheryl! This Gucci Marmont bag with serial number “498110 006789” is authentic. Cheers! Hi, Please can you check if my bag is authentic Gucci. I need proof in order to sell it. The gucci Store In Auckland NZ will only confirm the serial no. is correct. It also has a G on the tab so its from an outlet. How can i send you photos of it? Its black satin canvas, with 2 leather handles and medium size with serial numbers 257289 and underneath 204046. Hi Sarah! As far as I know, Gucci stores do not authenticate. For this free Gucci bag authentication, I will be needing clear photos of the Gucci bag, especially the Gucci marking inside the bag. Please upload on Imgur or Tinypic, and put the links in your comment. Cheers! Hi Sophie! All comments are under moderation to prevent spam (which I am getting A LOT). If you say that it is the serial number of this Gucci monogram backpack, including a letter, then this is a red flag. Cheers! Hi Sophie! All comments are under moderation. For this free Gucci bag authentication, I will be needing clear photos of the Gucci bag, especially the Gucci marking inside the bag. Please upload on Imgur or Tinypic, and put the links in your comment. Cheers! Please verify if these are authentic Gucci Marmont bags? Thanks. Hi Margo! Even without the photos of the Gucci leather tag and serial number, these bags have too many red flags. I’d stay away if I were you. Hi Ina! The link is not working. For this free Gucci bag authentication, I will be needing clear photos of the Gucci bag, especially the Gucci marking inside the bag. Please upload on Imgur or Tinypic, and put the links in your comment. Cheers! I just purchased the small Gucci Marmont bag in beige velvet on EBay. Can you help verify this serial number please? Hi Daniela! For this free Gucci bag authentication, I will be needing clear photos of the Gucci bag, especially the Gucci marking inside the bag. Please upload on Imgur or Tinypic, and put the links in your comment. Cheers! Thanks for your response! Here are the images below. Hi Daniela! This GUCCI Velvet Matelasse GG Marmont bag with serial number “443497 525040” is authentic! Cheers! I just wanted to make sure you received my reply with the picture links. I can’t tell because the comments do not post right away so I apologize if this is a duplicate comment. Would appreciate if you could authenticate this Gucci marmont bag for me. Thanks a million! Hi Petra! No red flags for this Gucci Marmont bag with serial number “448496 213048”. However, I hope you could also post a photo of the front of the leather tag. Cheers! i thought i have! sorry, added now thank you! Hi Petra! Yes, this Gucci bag is authentic. Cheers! Hi Marissa! I need clear and close-up photos of this brown monogram canvas Gucci diaper bag. Cheers! Hi Claudia! You may try BAGAHOLIC 101’s authentication service for only US$ 5. More information here: https://bagaholic101.com/gucci-authentication-service-by-bagaholic-101/ . Cheers! I put it on my google drive. Everything looks good as per your guidance. But the inner tag has not code and the innner lining is not peeling. Hi SJ! I will be needing clear and close-up photos of the serial number for this vintage Gucci bag. Please use the macro function of your camera. Cheers! Can you check if a Gucci bag I bought is real? Hi Serge! For this free Gucci bag authentication, I will be needing clear photos of the Gucci bag, especially the Gucci marking inside the bag. Please upload on Imgur or Tinypic, and put the links in your comment. Cheers! Hi Sharn! For this free Gucci bag authentication, I will be needing clear photos of the Gucci bag, especially the Gucci marking inside the bag. Please upload on Imgur or Tinypic, and put the links in your comment. Cheers! Hi! can you let me know what you think about this? Hi Marissa! For this free Gucci bag authentication, I will be needing clear photos of the Gucci bag, especially the Gucci marking inside the bag. Please upload on Imgur or Tinypic, and put the links in your comment. Cheers! Hi can you help me to check on this bag true or not.. it is hard to see. Thanks for your help. Hi Inong! This Gucci boston bag with web stripe, with serial number “47205 5168” is unfortunately fake. Hi Denise! This black Gucci monogram bag in horsebit hardware with serial number “114890 001018” is authentic! Cheers! Gucci bag has serial number 114900 ! 159847. Is it authentic? Hi Denise! For this free Gucci bag authentication, I will be needing clear photos of the Gucci bag, especially the Gucci marking inside the bag. Please upload on Imgur or Tinypic, and put the links in your comment. Cheers! Hi Marissa! This Gucci brown monogram diaper bag with serial number “123326 002058” is authentic! Cheers! Hi Ashlee! I need a clear photo of the serial number for this Gucci Dionysus bag. However, I am seeing red flags with the photos provided, thus I need to be sure. Cheers! Hi John! For this free Gucci bag authentication, I will be needing clear photos of the Gucci bag, especially the Gucci marking inside the bag. Please upload on Imgur or Tinypic, and put the links in your comment. Cheers! Hi Anna! This black Gucci monogram tote bag with serial number “189896 486628” is authentic. Cheers! Hello, I like the way you research and help. I just started buying Gucci and was almost scammed…thank you! Hi Kathy! Thank you very much for the kind words! Yes, this is the reason why I took the time to write this detailed guide to tell if a Gucci handbag is real or fake. I would not want others to be scammed! I understand not everyone’s comfortable paying for an authentication service, so a handy guide like this is a first line of defense. Cheers! Hi Shaun! I see red flags on this Gucci Marmont cardholder. I won’t buy it if I were you. Hi! I already left a comment but I’m unsure whether it posted. I purchased this on eBay Please let me know if this is fake! Hi Carly! All comments are under moderation to prevent spam. This black Gucci Marmont bag with serial number “443496 5554”, however, is fake. What are your thoughts on this bag I’m so worried that it isn’t real…thanks so much for your help!! Hi Meggy! Kindly ask the seller a clear and close-up photo of the serial number. Upload on either Tinypic or Imgur and paste the link here. Cheers! Bonjour j’aimerais acheter ce sac je fais appel à votre aide et votre oeil avisé car j’ai eu un gros coup de coeur..
Bonjour Mael! J’ai bien vu les photos afficher par le vendeur. Malhereusement, ce sac Gucci Soho en cuir avec le numéro de série “282309 0899” n’est pas authentique. J’espère que vous en trouveriez une autre. Bisous! Hi. Can you tell me if this Gucci bag is real? Can I email you a photo? Hi Amanda! For this free Gucci bag authentication, I will be needing clear photos of the Gucci bag, especially the Gucci marking inside the bag. Please upload on Imgur or Tinypic, and put the links in your comment. Cheers! Hi, my name is Wari. I just bought my first Gucci. I tried to spotted some mistake in the bag. Can you tell me if this gucci bag is real? Hi Wari! You may try BAGAHOLIC 101’s Gucci bag authentication service for only a minimal fee of US$ 5. More information here: https://bagaholic101.com/gucci-authentication-service-by-bagaholic-101/ . Cheers! I may have posted wrong, but could you help me authenticate this please :), thank you so much for your time! Hi Meggy! Thanks for posting the serial number “443496 213048”. This is for a Gucci Marmont bag, right? For this free Gucci bag authentication, I will be needing clear photos of the Gucci bag, especially the Gucci marking inside the bag. Please upload on Imgur or Tinypic, and put the links in your comment. I have a vintage Gucci bag I’m looking at online and it has 5 digit serial number 36279 right under the Italic font “gucci” stamp. I don’t see other Gucci logo or engraving on the outside of the leather bag (beige leather flap shoulder bag). Could this bag be a fake? Thank you. Hi Kim! For this free Gucci bag authentication, I will be needing clear photos of the Gucci bag, especially the Gucci marking inside the bag. Please upload on Imgur or Tinypic, and put the links in your comment. Hi Dawn! For this free Gucci bag authentication, I will be needing clear photos of the Gucci bag, especially the Gucci marking inside the bag. Please upload on Imgur or Tinypic, and put the links in your comment. Could you please verify this bag and check if it is real or fake? Hi Totti! This Gucci Marmont bag with serial number “443497 521000” is authentic. Cheers! Hi! I still cant’ decide if it’s authentic…Can you help me? Thanks in advance! Hi Kaya! This vintage monogram Gucci Accessory Collection bag with red and green stripes (very Ophidia!) and serial number “32.02.005” is authentic. Cheers! Bonjour, Mael! Normalement, je ne donne pas des conseils pour des sacs de Louis Vuitton. Mais cette pochette en damier, le numéro de série est actuellement le code de date, et on le lit comme “Made in France en janvier 2011”. =) Cet article est authentique. Hi there, just purchased a Gucci bag from Ebay but not quite sure if it is authentic. Would you be able to help? Hi Caitlyn! For this free Gucci bag authentication, I will be needing clear photos of the Gucci bag, especially the Gucci marking inside the bag. Please upload on Imgur or Tinypic, and put the links in your comment. Hello! I recently bought a gucci bag for a bargain and I’m confused now whether it’s an aunthentic one. Please help me confirm if it’s real or not. Thank you so much! Hi AJ S W-B! For this free Gucci bag authentication, I will be needing clear photos of the Gucci bag, especially the Gucci marking inside the bag. Please upload on Imgur or Tinypic, and put the links in your comment. Is the serial number ever on a nylon label instead of a leather one, and it starts with the letter H plus 9 digits ? Hi Mei! That doesn’t sound right. Just in case, for this free Gucci bag authentication, I will be needing clear photos of the Gucci bag, especially the Gucci marking inside the bag. Please upload on Imgur or Tinypic, and put the links in your comment. Hi Malgosia! The link is not working. I’m interested in this Gucci Duffle bag. Could you let me know your opinion on its authenticity? I’m requesting her for clearer photos of the gucci stamp on the outside and inside. Can you please check this,I got this as a gift from a friend 10 years ago and I did not ask if it was authentic or not out of fear of offending my friend. Hi Cecil! This monogram canvas Gucci bag with serial number “203692 0692” is unfortunately fake. Hi Ying! Good to hear this Gucci legit check guide helped you! Cheers! Hello, Could you please verify this bag. Real or Fake? Much Appreciated! Hello! Wondering if you could help authenticate this bag https://posh.mk/3Ch6dtRQeU? Hi Jane! This Gucci Marmont bag with serial number “448065 525040” looks off. I’d stay away, if I were you. Asking help to authenticate Gucci Boston Bag. i have no doubt this is fake. Hi Ann! The link is not working. Can you please check the below Gucci marmont if real of fake ? Hi Totti! This Gucci Marmont with serial number “443497 493075” has red flags. I personally would not buy it. Cheers! What do you mean by red flags ? It means that it doesn’t look real. Hi there, I was wondering if you could tell me if this Gucci Beltbag Coco Capitan Black is AUTHENTIC? I about to buy this bag from my friend. Any help would be greatly appreciated . Hi Gilberto! For this Gucci Coco Capitan bel bag with serial number “493869 170701”, I would recommend posting a clear and close up photo of the leather tag. So far, something looks off. Hi HHMN! This Gucci Marmont bag with serial number “443497 523120” is authentic. Cheers! Hi, please is this Gucci marmont with serial number 446744-170701 fake?. Hi Natasha! Based on the photos that you sent, I would not be confident to buy this Gucci bag with serial number “446744 170701”. This looks off. Hi! I love your blog. Please help me to ensure this pre-loved bag is indeed authentic before I make the purchase. I, like many others really appreciate your free service! Thanks, MGlo! However, I cannot access the link you shared. Hi Could you help take a look for me if this vintage Gucci is authentic. Hi Emikore! The link you provided is not working. Hello! Thank you so much for this guide- what a lifesaver. Would you be able to tell me if this one is real or fake? Thank you! Hi Lexi! You’re very much welcome! I’m always happy to help. This Gucci Smalle Beige Dionysus bag with serial number “400249 585795” is authentic. Cheers! Hi! Im wondering if this bag is real or fake, still having trouble determining the differences between real and fake. Here is the photo. Hi Natalie! You may try BAGAHOLIC 101’s Gucci bag authentication service for only a minimal fee of US$ 5. More information here: https://bagaholic101.com/gucci-authentication-service-by-bagaholic-101/ . Cheers! Hello, would you please help me see if this Gucci Marmont is real or fake? Hi Lana! You may try BAGAHOLIC 101’s Gucci bag authentication service for only a minimal fee of US$ 5. More information here: https://bagaholic101.com/gucci-authentication-service-by-bagaholic-101/ . Cheers! I hope you can help me if this Gucci Bag is authentic or not. Thank you so much. Hi Jessy! You may try BAGAHOLIC 101’s Gucci bag authentication service for only a minimal fee of US$ 5. More information here: https://bagaholic101.com/gucci-authentication-service-by-bagaholic-101/ . Cheers! Hi Jaidie! You may try BAGAHOLIC 101’s Gucci bag authentication service for only a minimal fee of US$ 5. More information here: https://bagaholic101.com/gucci-authentication-service-by-bagaholic-101/ . Cheers! Hi can you take a look at this one for me? Hi Cristina! You may try BAGAHOLIC 101’s Gucci bag authentication service for only a minimal fee of US$ 5. More information here: https://bagaholic101.com/gucci-authentication-service-by-bagaholic-101/ . Cheers! I was about to buy a convincing looking Gucci ‭‭sidebag but needed give authenticate first, after reading this article I’m still not 100% sure. I have the photos on my camera roll but don’t know how to post them as a link, is there an email or anything I could send to? Hi Ben! You may try BAGAHOLIC 101’s Gucci bag authentication service for only a minimal fee of US$ 5. More information here: https://bagaholic101.com/gucci-authentication-service-by-bagaholic-101/ . Cheers! Hi, what a great site! Thanks so much for this helpful resource. Would you be able to tell me if this bag is real or fake? Hi Rose! You may try BAGAHOLIC 101’s Gucci bag authentication service for only a minimal fee of US$ 5. More information here: https://bagaholic101.com/gucci-authentication-service-by-bagaholic-101/ . Cheers! Can you please help me verify this bag before making any decisions? I read through all your pages and can’t seem to convince myself. Hi Carlos! You may try BAGAHOLIC 101’s Gucci bag authentication service for only a minimal fee of US$ 5. More information here: https://bagaholic101.com/gucci-authentication-service-by-bagaholic-101/ . Cheers! Hi! I was about to make a purchase before I stumbled upon your super helpful website! I was wondering if you could authenticate this Suede Patent Small Ophidia bag for me? I know the pictures aren’t the best quality, but that’s all she could take! Hi Tiffany! You may try BAGAHOLIC 101’s Gucci bag authentication service for only a minimal fee of US$ 5. More information here: https://bagaholic101.com/gucci-authentication-service-by-bagaholic-101/ . Cheers! Hi Reina! Please upload a clear and close-up photos of the Gucci bag on Tinypic or Imgur, and paste the links here. Cheers! Hi Maria! For a stress-free buying, you may try BAGAHOLIC 101’s Gucci bag authentication service for only a minimal fee of US$ 5. More information here: https://bagaholic101.com/gucci-authentication-service-by-bagaholic-101/ . Cheers! Hi! Pleas help me with this. The number of the Gucci marmont bag is 446744 801688. Hi Sophia! For a stress-free buying, you may try BAGAHOLIC 101’s Gucci bag authentication service for only a minimal fee of US$ 5 with a quick turnaround. More information here: https://bagaholic101.com/gucci-authentication-service-by-bagaholic-101/ . Cheers!